Judge Richard H. Dinkins was awarded the John C. Tune Public Service Award at the Nashville Bar Association’s Annual Banquet in December. The award—the highest honor a member of the NBA can receive—recognizes a distinguished member of the legal community who makes outstanding contributions to the greater Nashville area community and has shown the highest degree of dedication—not only to his or her work as a lawyer—but to the betterment of the community in which he or she lives. Judge Dinkins was appointed to the Tennessee Court of Appeals by Governor Phil Bredesen in January 2008. Prior to his appointment, Judge Dinkins served as chancellor of the Davidson County Chancery Court, Part IV, starting in September 2003. After graduating from Vanderbilt University Law School in 1977, he worked as an associate at the law firm of Honorable Avon M. Williams Jr., whom he joined to form the firm Williams and Dinkins in 1981. From 1999 to 2003, he also served as a member of Dodson, Parker, Dinkins, and Behm, P.C. In his practice, Judge Dinkins served as counsel to Fisk University and the Metropolitan Development and Housing Agency. 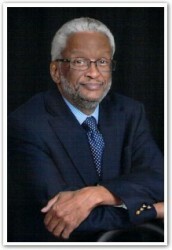 Judge Dinkins engaged in the private practice of law, practicing in a general civil practice for 26 years. "I have been so blessed over the course of my life with opportunities and the advice, counsel and assistance of others, and I believe that I have a duty to serve where I can and where I am able," Judge Dinkins said. "There are various needs in the social fabric of our community, along with opportunities to assist in meeting those needs by working with churches, organizations, and groups. Giving advice and guidance to those who are doing the day-to-day work of assisting those in need, or to those making decisions that affect the community, is my opportunity to serve." Judge Dinkins currently serves on the boards of Oasis Center, LEAD Public Schools, the Tennessee Association of Legal Services Programs, and the Tennessee Jazz and Blues Society. Dinkins noted, "The most rewarding aspect is getting to work with great people who are doing great things, most times without recognition and sometimes without appreciation. I'm just a part of a team." The John C. Tune Public Service Award was established by the NBA Board of Directors in April of 1983, but because of its unique nature and its status as the highest award given to a member, it was agreed that the award did not need to be given annually, but only when there is a member deserving of this award.